Description: Digital image from Kim E. Piersol original 35mm Kodachrome transparency. 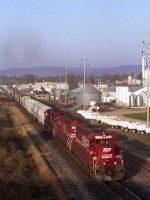 B&OCT Barr Yard. Description: Digital image from Kim E. Piersol original 35mm Kodachrome transparency. 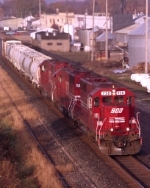 B&OCT Barr Yard. On the way to MK for rebuild. Description: This SOO 113 car westbound was rolling along Daytons Bluff as it passed the Hoffman Av interlocking. Description: CP trai 391 rolls past Erie milepost 250 as it approaches Waverly. There must have been a slow order, as this is only 2 1/2 miles west of the semaphore shot at Barton. Id catch him again twice before Waverly, and again at Chemung. Description: Train 391 rolls west past the aging sentinel on the opposite track as it makes its way to Buffalo with 63 cars behind a pair of original SOO SD40s in the candy apple red scheme. Description: Train 391 rolls past the Erie station at Chemung on a gloomy day typical of spring in the Tier. Description: There was a semaphore on track 2, 245-2, that you had to cross a field to reach. As a result, I did not shoot it much. Heres a from the road look as 391 passes, the board seen between the two diesels. Description: There were a lot of Erie semaphores still in service at the time. This is the third one I shot this train with that day. The pipe hanging down from the signal was for the hot box detector indicator light, now removed since new radio alarm detectors had been installed a couple years before.